Add extra sizzle to your meals and surprise you and your family with the naturally delicious taste of Himalayan Salt. What makes Himalayan Salt different from regular salt? The Himalayan Mountains formed over 200 million years ago, rising over sea salt beds and leaving Himalayan Salt hidden deep beneath its snowy peaks. Our Himalayan Salt kitchen products started their journey within these mountains: carefully extracted, crossing land and sea, and brought to your table for all to enjoy. Experience the difference in taste, color and texture that Zenware Himalayan Salt has to offer. Enjoy simmering, searing and serving your favorite foods and discover what makes your taste buds tingle, with Zenware. Designed with your health and taste buds in mind, Zenware knows that food preparation is just as important as the food itself. The tools and methods you use to prepare your meals can change how your body feels. Zenware aims to equip you with the best tools you need to prepare easy and delicious meals, all while keeping your healthy lifestyle in mind. Whether you are preparing a simple snack for one or a fancy feast for many, Zenware's exceptional quality materials and foolproof designs provide a one-stop-shop for all of your kitchen's needs. Unleash your appreciation for fun, simple, and safe cooking with Zenware. Disclaimer: Zenware and its agents will not be responsible for any and all liability related to improper or unintended use or modification of the Zenware Salt Block and Salt Block Holder. Add extra sizzle to your meals and enjoy the naturally delicious taste of Himalayan Salt with the Zenware Himalayan Salt Block and Salt Block Holder set. Himalayan Salt Blocks impart their flavor to food, making them great for cooking directly on your stovetop or BBQ Grill. Then, use the Holder to safely transport your Salt Block to the table. *NOT recommended for oven use. 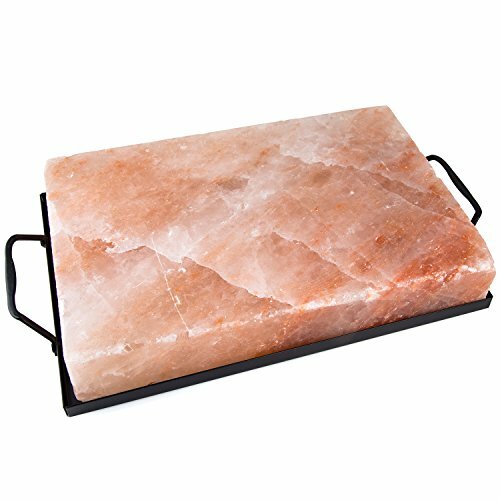 The Salt Block Holder is a durable metal tray that provides the sturdy support and protection to extend your Salt Block's life, even as it naturally wears down into pieces over time. It works as a frame to keep the salt slab pieces together, so you can keep on grilling. Himalayan Salt's natural pink crystals also enhance food presentation, making it suitable for serving chilled food. Place Salt Block in the Holder, refrigerate for an hour or two and use it as a serving plate. Whether hot or cold, Himalayan Salt tiles hold temperatures effectively (up to 500°F). Impress friends, family and guests at your next holiday feast or barbecue get-together! Whether you are grilling skewers together or using it as a serving tray, your Himalayan Salt Block and Salt Block Holder are sure to please both your eyes and your taste buds. If you have any questions about this product by Zenware, contact us by completing and submitting the form below. If you are looking for a specif part number, please include it with your message.